Crammed with apples, subtly fragrant with thyme and blanketed with a cheddar crumble this gluten-free Apple Cheddar Thyme Crumble Cake is the perfect comforting Autumnal cake. It would be remiss of me not to explain the absence of a blog post last week. If you follow me on Instagram then you’ll know, since I have spoken about it in my last few posts, that my father passed away very suddenly last weekend. I have written before that my father and I had a difficult relationship at times and with that comes an absurd arrange of emotions about his death. Childhood stuff that I have long since moved past now disturb my sleep anew. However I try to take comfort that in the last few years we had reached a more comfortable place. We would speak every few weeks and connect on our love of food and kitchen adventures and I would give him the latest on the children. A photograph that I took of Dad, Cole and Beau on our last visit was such a treasure to him and I just feel incredibly sad that he won’t get to see them grow up. Cake always goes hand in hand for me with any significant life event. Luke took Cole and Beau out for a couple of hours to soft play the day after he died so I could have some peace with my thoughts and freedom to cry. I stepped straight into the kitchen and grabbed the flour, sugar and butter to seek solace. I feel guilty that this cake will be mired in the melancholy that surrounds this post but it’s almost fitting as a slice of this cake is a huge comfort. The sour cream sponge is densely crammed with apples and fragrant with thyme. A soft cheddar crumble blankets the surface to add a delicious mature nuttiness. I have chosen the earthy flavour of sorghum flour to compliment the cake, sweet rice flour to bind and give texture and potato flour to add fluffiness which works because of its hydroscopic nature. I have had this cake on the cake stall many times and I am often asked what gave me inspiration for this slightly unusual combination. I have always loved apple pie with a cheese pastry crust, the smooth balance of a fine crumbly cheddar and sweet crisp autumn apples is never a taste I tire of. And cheese cake is a thing right? Dad didn’t have a sweet tooth, he preferred the cheese board after a meal. I think this Apple Cheddar and Thyme Crumble Cake then is a fitting tribute. 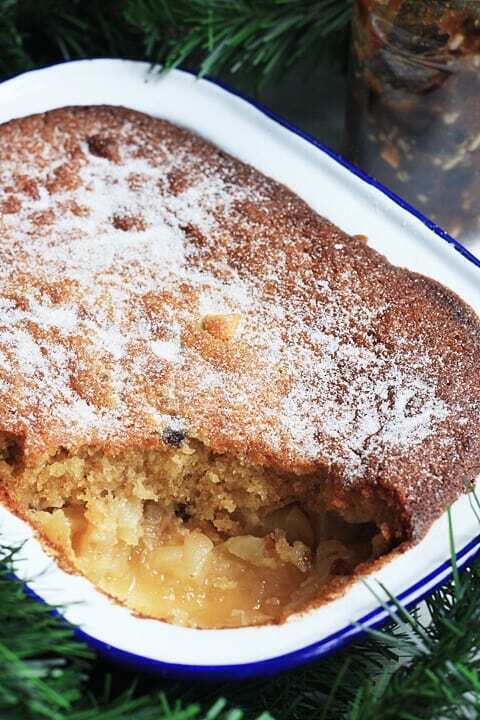 I urge you to give this Apple Cheddar and Thyme Crumble Cake a try and if you do then please leave a comment below and/or give the recipe a rating. I’d also love it if you’d share your version and tag me on instagram. 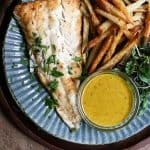 It is so lovely for me to see your creations and variations of my recipes. 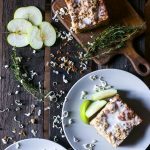 This gluten-free Apple Cheddar Thyme Crumble Cake is the perfect comforting Autumnal cake, crammed with apples with a delicious cheddar crumble topping. Pre-heat oven to 170°C/160°C (fan oven)/gas mark 4 and line and grease a 9x13” rectangular cake tin. First make the crumble topping by rubbing together all the ingredients except the cheddar. Then stir in the cheddar cheese. 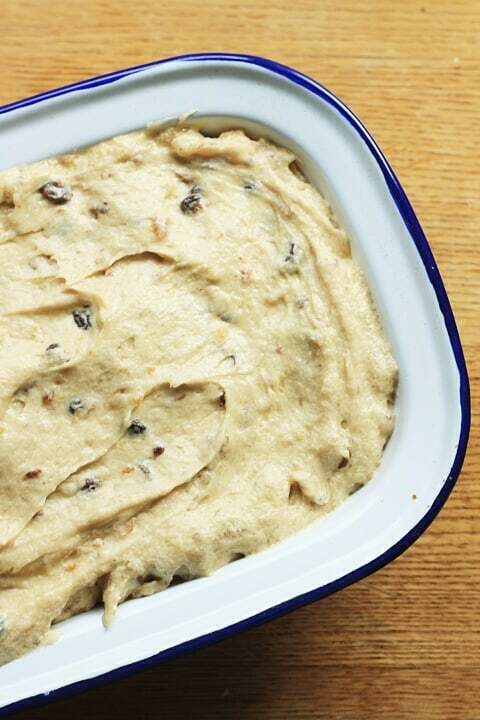 Spread out onto a baking sheet and place in the freezer whilst you prepare the rest of the cake. In a large bowl sift the flours together with the baking powder, bicarbonate of soda, salt, thyme leaves and set aside. Cream the butter and sugar in a food mixer for 10 minutes until light and fluffy. Add the eggs, beating in one by one then add the vanilla extract. Spoon in 1/3 of the flour mix, beat into the batter then add 1/2 of the sour cream and beat in. Repeat again and then add the last 1/3 of flour mix, beating until the batter is smooth. Pour half of the cake mixture into the cake tin, then tumble in half of the chopped apples. Pour the rest of the cake mixture over, smooth and then scatter the rest of the apples over the top. Finally sprinkle over the crumble topping so all the apples are covered. Bake in the oven for 50 minutes, check after 25 minutes and if you think the cheese is browning too much then place a loose sheet of tin foil over the top of the cake tin for the rest of the bake. Remove the cake from the oven, leave to rest for 5 minutes then carefully remove from the tin. Let the cake cool completely on a wire rack until you decorate with the glaze. To make the glaze mixing the icing sugar with the milk until thick but pourable. Drizzle over the cake and then leave to set for at least an hour before cutting into squares. It’s earthy, nutty and compliments the apples, thyme and cheddar in this cake perfectly. 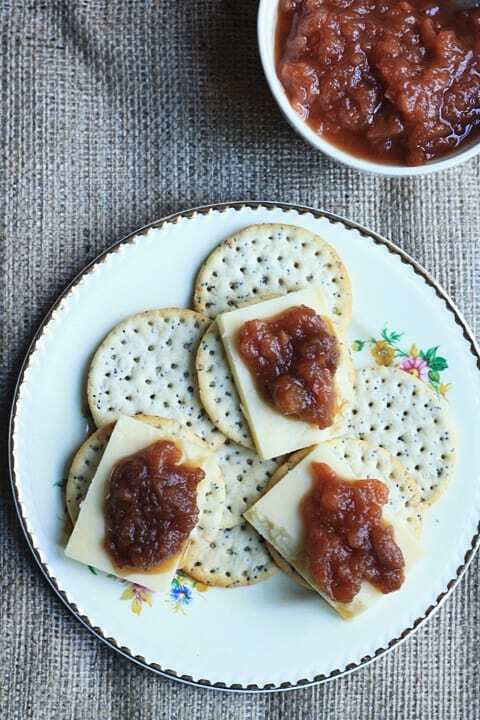 Baked Apple Butter is the perfect hybrid between a jam and a chutney. 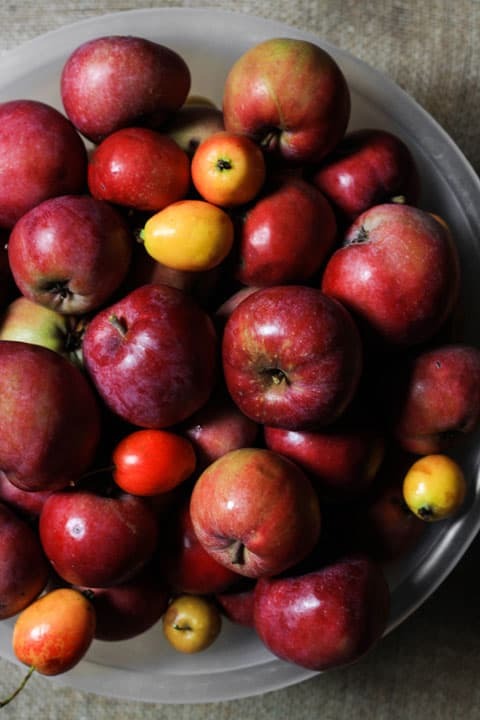 The apples are stewed in cider, brandy, honey and spices then smoothed and baked slowly in a low oven for the most intensely thick and rich apple sauce that is the ultimate Autumn preserve. I have mentioned before but Billy Buddy isn’t always impressed when we hijack his morning walk for a spot of foraging, but this time Cole was also not so impressed. Our method of plucking the apples from the top of the tree is to vigorously shake the branches leading to golf ball sized apples showering on our heads. It was my job to pull Billy and Cole out of the way as these mini meteors rained down from the sky. Very frustrating for a 15 month old who does not like being told no he can’t have that, no he can’t go there and yes by doing it his own way he will put his little life in danger again, for the tenth time that morning. However, for twenty minutes work at 6.30am with the ground crunchy from the first frost we were inundated with 2.5kg of the most delicious red eating apples, and thanks to the crab apple tree next door, a few of those little princes were added to imbue a little bit of tartness to the recipe I had planned. 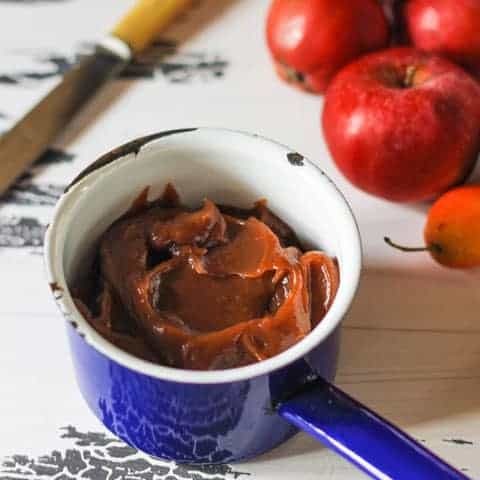 Baked Apple Butter is the perfect choice for a glut of apples. 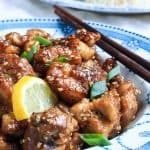 It is best working with a large amount of the fruit as thanks to the slow baking the sauce is reduced quite a bit so you want to make sure all your efforts yield a good amount. I sell my Baked Apple Butter at my market stall and it’s not a very ubiquitous preserve in the UK so I am always asked lots of questions about it. 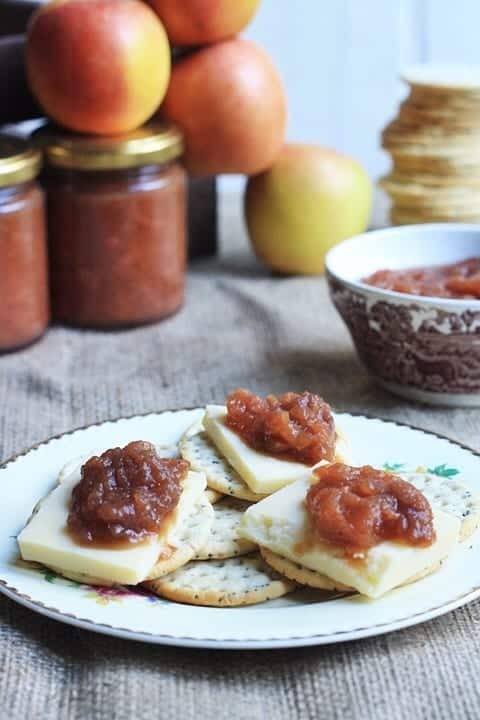 It is an ideal preserve if you are not sure whether to get a jam or a chutney as it does a little of both jobs and can be eaten with both sweet and savoury. 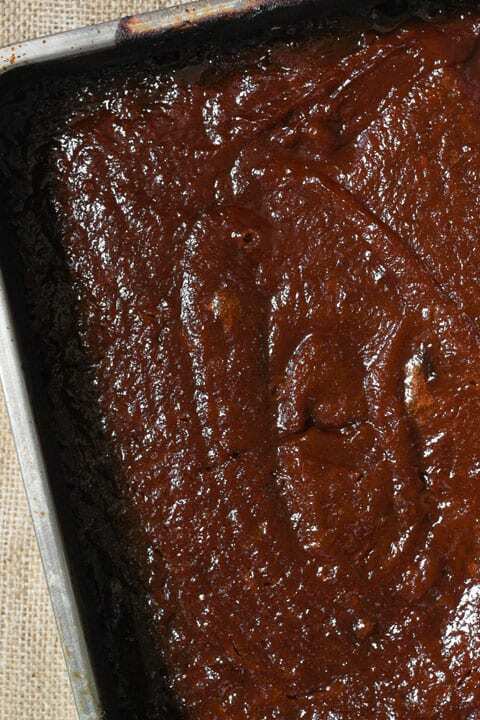 But Baked Apple Butter is also a wonderful baking ingredient. It’s what I use in these Toffee Apple Cupcakes but you can also use it instead of the pear butter in this Spiced Pear Butter and Hazelnut Praline Cake for an apple version. And gosh if you were to beat 250g unsalted butter with 250g icing sugar for 5 minutes then add 150g Baked Apple Butter then you have the world’s most divine buttercream for your vanilla cupcakes. It’s definitely an ingredient worth experimenting with but if you really can’t be bothered then as I said, a fingertip and the jar is really all you need. Baked Apple Butter is an intensely thick and richly spiced apple sauce that is the ultimate Autumn preserve. 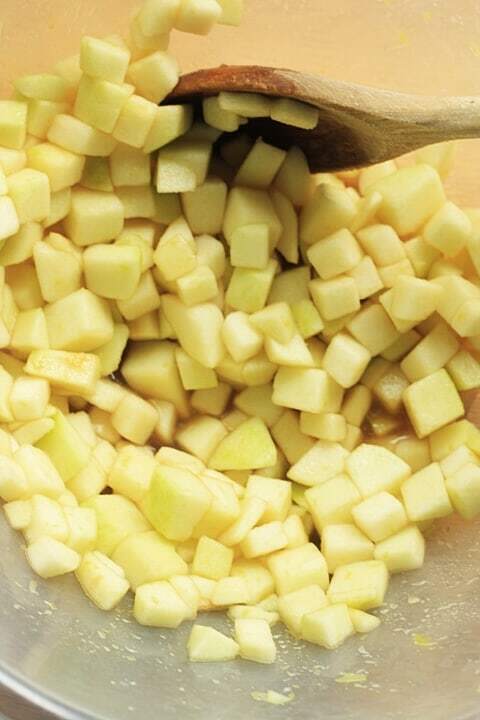 Peel, core and dice the apples* then place the diced apples in a saucepan with the rest of the ingredients and bring to a low boil. Reduce the heat to a simmer and cook until the apples have softened. 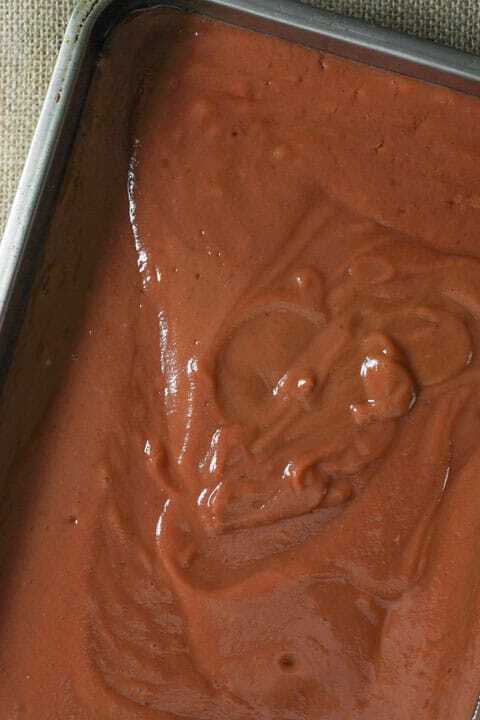 Leave to cool slightly before you blend. At this point I usually leave it overnight before I blend. Place the blended apple puree into roasting dishes, so the puree is about 2 inches thick and bake in a 150°C oven for two hours until extremely thick. Stir every 30 minutes. Blend the thickened apple butter again to smooth out the final result then decant into sterilised jars. You can either keep the apple butter in the fridge for a couple of weeks or you might like to increase the life of the Baked Apple Butter by processing the jars in a water bath which means they can be kept for at least 6 months somewhere dark and cool. For more information on canning and water baths see here. 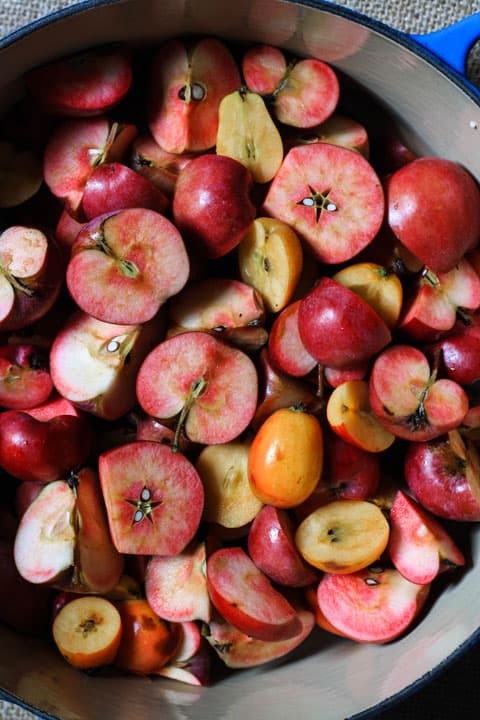 *If you have a food mill then follow the following method in place of Step 1: Halve the apples, core and peel intact an place them in a saucepan with a splash of water and simmer until the apples have softened. Remove the apples and pass through a food mill. Place the apple puree back into the saucepan with the rest of the ingredients and bring to a boil. Turn off the heat. is the one I use and I absolutely love it. 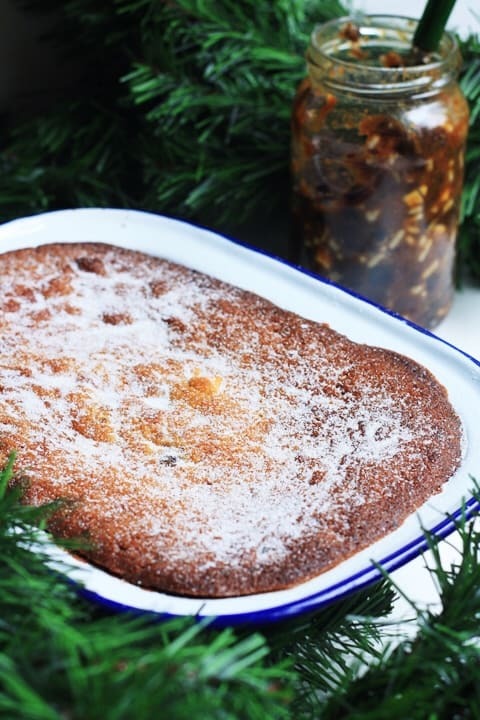 Bramley Apple Mincemeat Pudding is a must at this time of year. 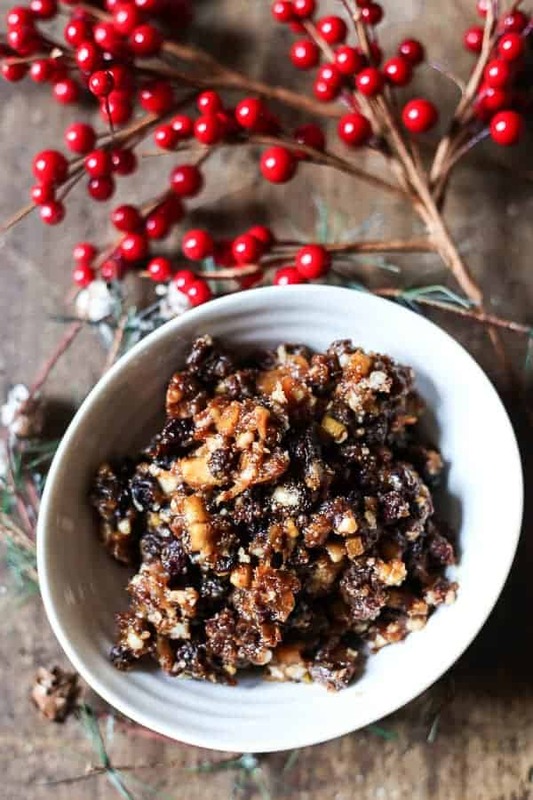 It’s an excellent way of using up all your excess mincemeat or makes a lighter alternative to Christmas Pudding at the end of your festive feast. 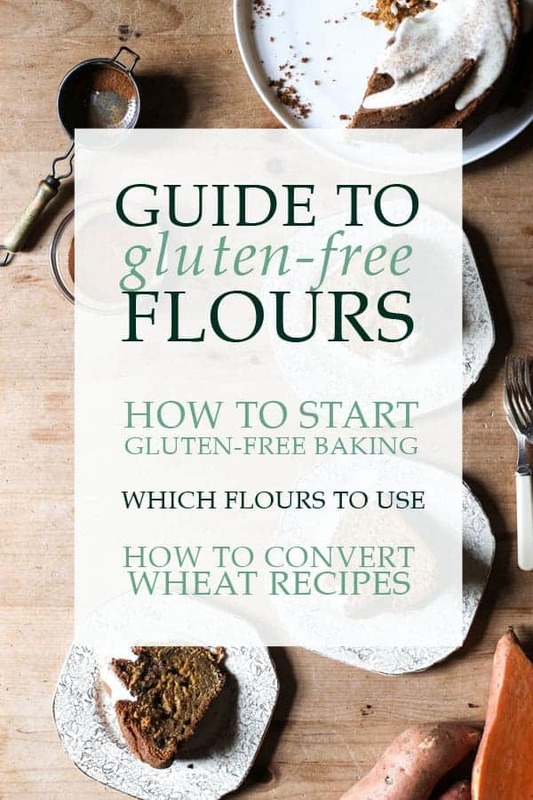 Both the wheat and gluten-free recipes are listed below. It’s crazy how much I love mincemeat. In fact it’s just as well that it only comes out once a year as not only do I get to thoroughly enjoy mince pie season but it means I am held back from overindulging all year round. I have made close to 100 jars of mincemeat this year, for selling on my preserves stalls, and it hasn’t diminished my love for the stuff at all. Making the mincemeat is one of my very favourite cooking jobs to do, it fills my kitchen with the heady scent of brandy, plump fruits and warming spices and the resulting mixture is so versatile that it would be a shame if you merely confined it to just a mini pie filling. I tweaked some of the sugar in my original recipe and took the mincemeat through the sponge topping instead of allowing it to languish at the bottom with the bramleys and suddenly an instant classic was born. I like the tartness of the bramleys just as they are but here I gave them a kiss of brown sugar to take the edge off. If you need your apples sweeter than do add more sugar but I think the fruity mincemeat in the sponge contrasts deliciously with the natural apple taste. Of course there will be disagreements on how this should be served. I drowned mine in lashings of custard. And not just any custard, I couldn’t be bothered to make my own own despite having a plentiful amount of double cream and eggs in the fridge and for the first time in my whole life I whisked up some Bird’s custard powder and it turned out quite delicious. So there, those of you that think I’m a food snob. I can get down and dirty with the rest of you any day of the week. 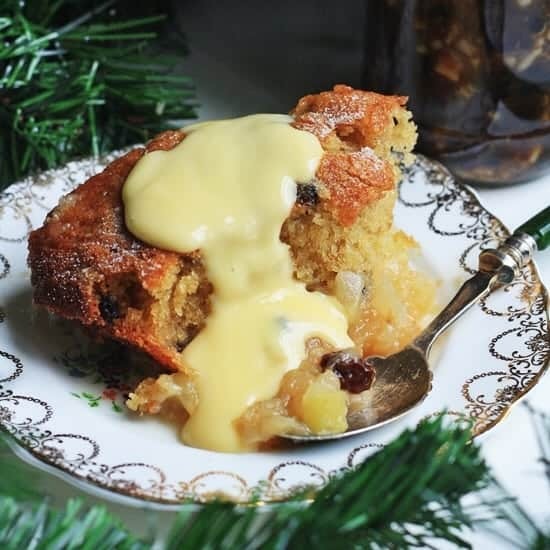 Some festive desserts have the propensity to be a bit of a faff but this took moments to mix up and bake, perfect for cold nights in front of the fire. I urge you this year to be adventurous with your mincemeat and it would be lovely to hear some of your favourite mincemeat experiments. 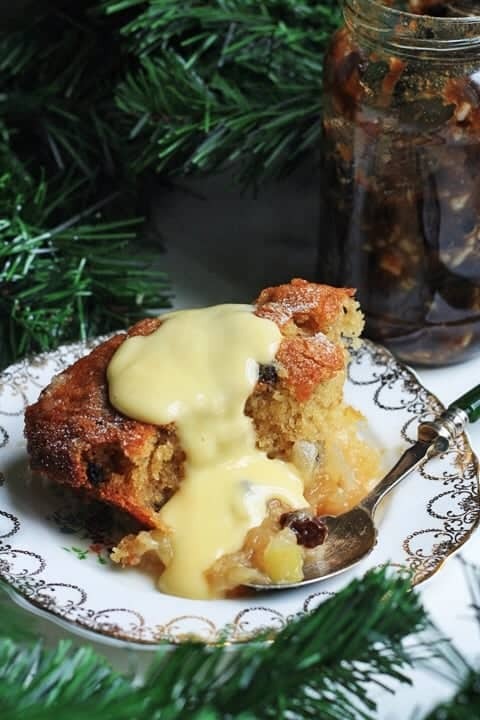 Bramley Apple Mincemeat Pudding is an excellent way of using up all your excess mincemeat or makes a lighter alternative to Christmas Pudding. Stir in the vanilla extract and then the mincemeat. Sift together the flour, baking powder and salt then mix into the rest of the ingredients until just combined. Pour the batter on top of the apples then bake in the oven for around 45 minutes until the sponge has browned on top and an inserted toothpicks comes out clean. 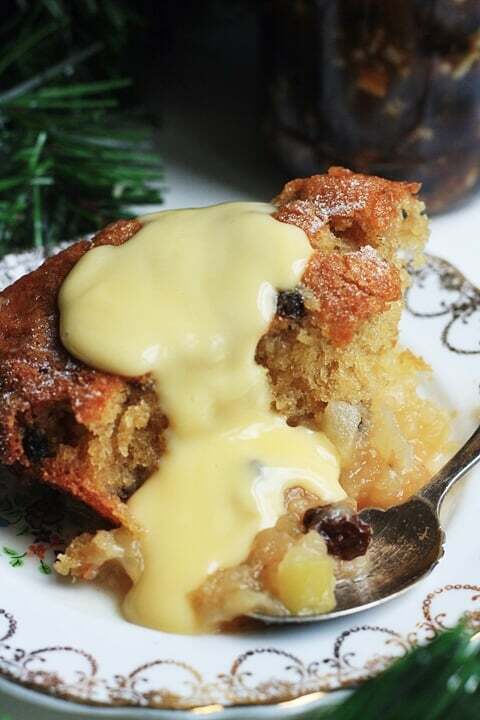 Sprinkle over the teaspoon of caster sugar and serve with lashings of custard. 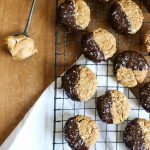 The result is amazing and just as fluffy and deeply delicious as the original recipe. I have been making chutneys and jams for my friends and family for Christmas presents as long as I can remember. It’s perhaps my annual ritual that I treasure the most. It signifies making the most of the autumnal farmers’ market or foraging treasures and is one of the first steps I take each year when starting to plan for the festive season. There was a time when I rotated the chutneys I made, perhaps an apple, pear and hazelnut chutney, often a piccalilli or even a traditional dowerhouse chutney. However since I developed this particular Apple and Stem Ginger Chutney a couple of years ago there has been absolutely no looking back. It has been one of my favourite kitchen creations and now I make it every single year to pass onto my loved ones, and of course to scoff myself with a mountain of cheese. I rather like it as it’s not one of those chunky chutneys that makes your sandwich all lumpy, or a chutney that is stuffed with little pops of sultanas making the whole affair too fruity. No, this chutney has the perfect balance of texture from the soft apples, of sweetness from the stem ginger and a warmth of spice from the root ginger, chipotle chilli powder, nutmeg and cinnamon. In fact I love this chutney so much that it became one of the first recipes to be cemented in my new preserves venture ‘From The Larder’. I have made jars upon jars this year, so that I can spread the joy a little further than my friends and family and I will be selling it on all my market stalls leading up to Christmas. My inaugural preserves stall is at the Stroud Green Winter Fair this Saturday 22nd November at the Stapleton Tavern in Stroud Green and I can’t wait to showcase all the lovely produce I have been foraging for, jarring and canning since the summer. 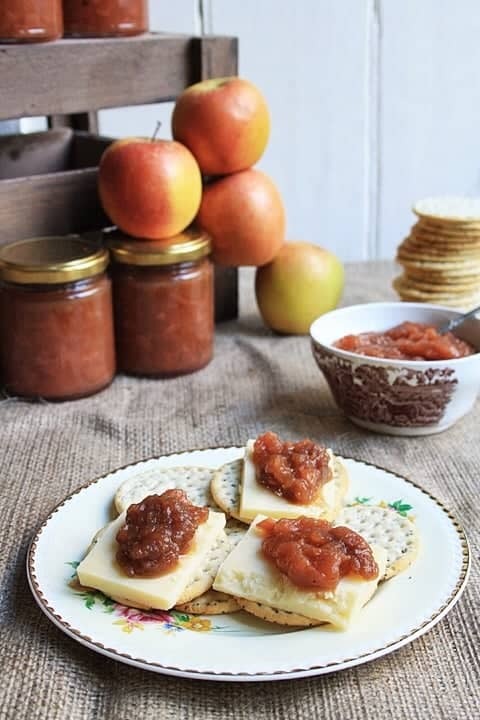 If you are around then do drop by and pick up a jar of this Apple and Stem Ginger Chutney. However, if you are far away then don’t fret as I’ve included the recipe below so you can make a batch of your own. 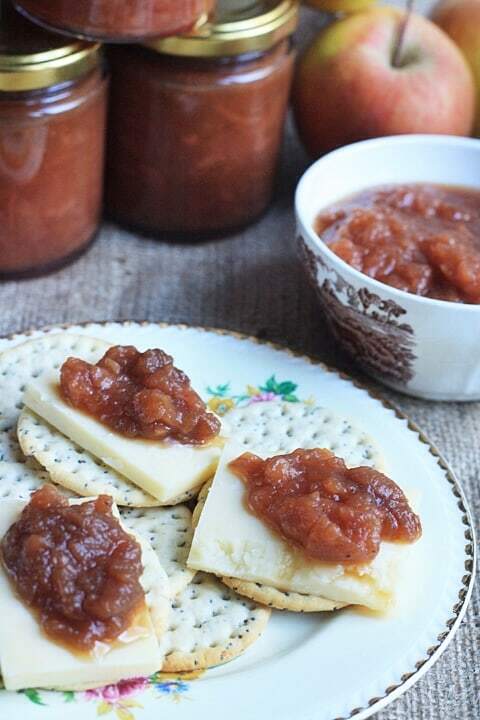 This chutney is perfect on your festive cheeseboard as it goes with pretty much any cheese. It’s also incredibly addictive so don’t be surprised if you find you are balancing more chutney on your cracker instead of cheese. This recipe makes a good few jars but it’s perfect to give away as presents or to hoard yourself so you can keep your supplies well on the go until next year’s batch. Place the spice bag ingredients into a muslin bag and then put into a large preserving pan with the rest of the ingredients. Bring slowly to the boil, then simmer for 2.5 hours. Remove the spice bag then decant the chutney into sterilised jars. Keep in a cool dark place for 2-3 months before eating. I know, it’s crazy but true, since the beginning of January there has been no cake in this house and not surprisingly its absence is felt as keenly as a lost limb. Even though if at the end of December it felt like I would swear off cake, biscuits and chocolate for good, having indulged in Christmas excess. But like the sugar junkie I am I have been yanked off the wagon and thrown to the wolves. And I blame TV. 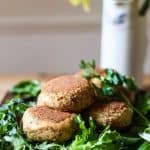 Just before hubby came home I was drifting across the food channels, avoiding anything with loud shouty men and I came across the cookery show of one of my favourite food bloggers. Now, this will come to no surprise to those who know me but I secretly like to think I’m a bit of a cowgirl. So what if I live 5000 miles away from the nearest cattle ranch, riding horses makes my bum hurt and I can’t at any time be more than 15 mins away from the nearest Vietnamese restaurant. I strut down Stroud Green Road in my cowboy boots with pride. So when I started reading The Pioneer Woman’s blog a few years ago, I fell in love. 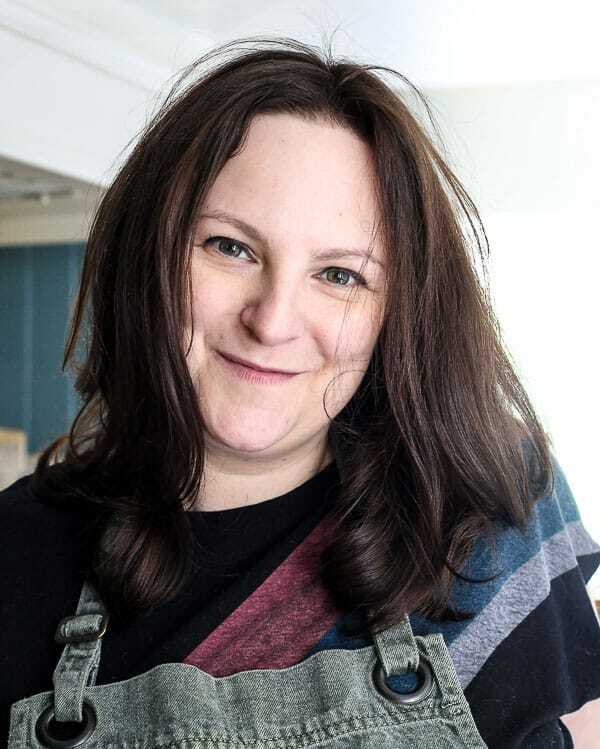 At the moment she has a cookery show and I love watching those vast landscapes and clear skies, imagining myself herding cattle at dawn followed by downtime in the lodge frying steaks as big as my head and whipping up peach cobblers. 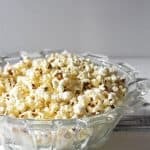 Ree Drummond always seems so happy and unflustered as she effortlessly fronts her own TV show, writes her blog, homeschools her children and still manages to reign supreme in her kitchen. Now this blogger struggles to toilet train one puppy, barely manages a mediocre run round the block, never does her homework for writing class, always forgets at least two vitally important things from the shopping list and is constantly frustrated by the lack of workspace in my tiny North London kitchen. I might be the epitomy of fluster. There is always one thing that calms me down though and that’s getting involved in a new recipe. 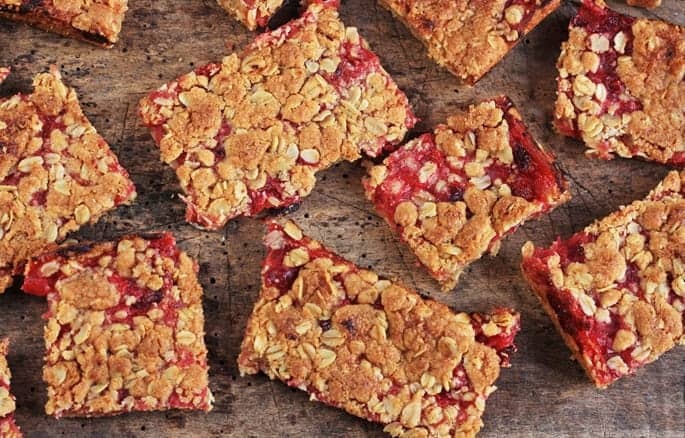 And these oat bars which Ree was making on her cookery programme just made me want to run into the kitchen and start mixing up a batch, mainly since I immediately foresaw them with a fluffy tart apple filling. I am on a bit of bramley apple kick at the moment, my current snack being unsweetened bramley apple sauce stirred up with a tablespoon of coconut milk for mid-afternoon fixes. It’s addictive. I also remembered about some leftover cranberries buried in the freezer which I am keen to use up before they become seasonally irrelevant. So I added some of those into a saucepan with the bramleys and stewed them up with just a touch of sugar. The oaty mixture encasing the fruit is packed with sweetness so balances out the slight sourness of the soft middle. So, now my cake tin is happy. And so are the other members of the household. Put the apples and cranberries in a medium saucepan with the caster sugar and water. Put the lid on and stew on a low heat for 20-30 mins, stirring occasionally until they have broken down and softened. Leave to cool. Pre-heat the oven to 170°C and grease a rectangular baking tin 9” x 13”. In a large mixing bowl add the rest of the ingredients and rub together with your hands until everything has come together to form a light dough. 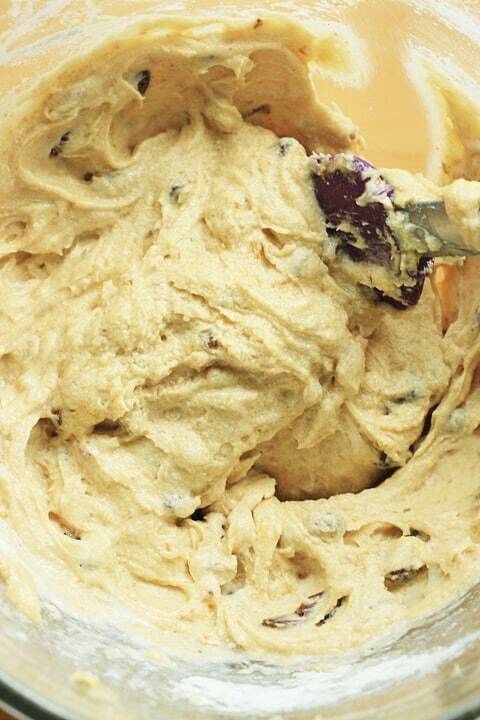 Press ½ the dough into the base of the baking tin to form an even layer. Spread the cooled fruit on top. Crumble the rest of the dough on the top and press down lightly into the fruit, don’t worry too much about it spreading out evenly. Bake in the oven for 20-30 mins until the top is golden brown and the fruit bubbling up. Remove from the oven and leave to cool in the oven for an hour or so before removing from the tin and cutting into bars.